I thought I would start putting together a series of present ideas in the run up to Christmas. I’ve tried to include ideas for everyone in this one and take advantage of some excellent deals, so you can make an early dent in the Xmas shopping AND bag a bargain. For the men in your life, you can’t beat a cashmere jumper. Especially when there is 40% off. The Champneys holdall is lovely and a real bargain at £20. For anyone with a teen boy, I thought the Vans would make a great present at that price. For anyone you know that loves a bit of homeware, the woven tray, washing basket and napkins would all make great gifts and are real bargains. 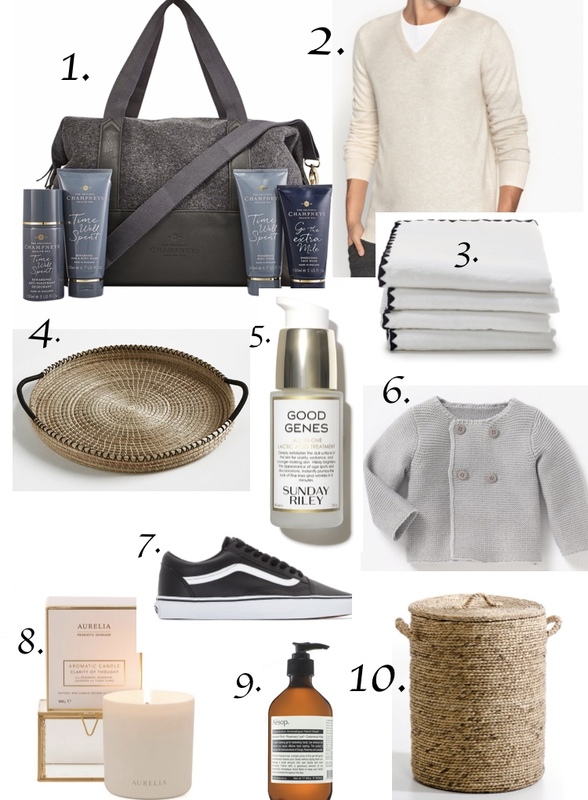 For the little ones you need to buy for, the grey cardigan would make a lovely gift. And finally for anyone in your life that deserves a luxurious treat, you can’t beat Sunday Riley, Aesop and Aurelia. All gifts that I would love to receive myself!